Detailed heat gain calculations can be produced ensuring the correct choice of unit for every application and as distributors for many leading manufacturers you can be assured that we have the right product at a competitive cost. Split Cassette models are designed to be fitted flush in a suspended ceiling and distribute air in four different directions. Side ducts may also be fitted, allowing conditioned air to be ducted to other rooms. Cassette units incorporate a drainage pump to remove condensed water. Split Wall & Floor Mounted units are used to condition small to medium sized offices and are easy to operate using the remote control unit. 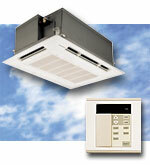 Designed for comfort cooling, they can be small enough to be installed above a door. Split Ducted units are designed to expel conditioned air through several outlet grilles where more than one area or room needs to be conditioned. This unit combines high performance with minimal visual disruption, ideal for high profile areas. 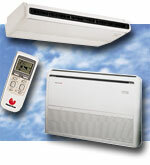 All the above units are available in cooling only and heat pump models. Multi-split systems are also available i.e. several indoor units can be connected to a single outdoor condenser. For areas such as Electronic & Calibration Laboratories where it is necessary to guarantee precise control of Temperature and Humidity, Airflow have the answer. We install systems with a tolerance of +/- 0.3°C in temperature and +/-2% for relative humidity (on units up to 12.8kW). Projects large or small, we would be pleased to discuss your design requirements and put forward a detailed specification, free of charge and with no obligation. Please contact our Sales Team for further information. Process Extraction systems are designed to suit specific requirements. From welding fumes to solvents, oil mist to dust, Airflow can design and install a system to suit your requirements. All Local Exhaust Ventilation systems are supplied with detailed commissioning data sheets ensuring that equipment can be effectively maintained and continue to meet the design criteria. 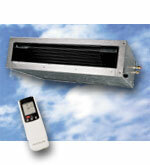 Ventilation creates a healthier and a safer environment. Using the latest technology Airflow engineers can quickly assess an existing system and make recommendations for maintenance or modification. Extract ventilation systems are designed to be quiet and unobtrusive making your environment a pleasant place in which to work. Positive Pressure systems incorporating filtration up to H.E.P.A. standards with 99.999% efficiency for particles greater than 0.3 microns are installed to Cleanrooms and other sensitive areas preventing the ingress of dust and potential contaminants.